3rd Grade Math Boom Cards Bundle! 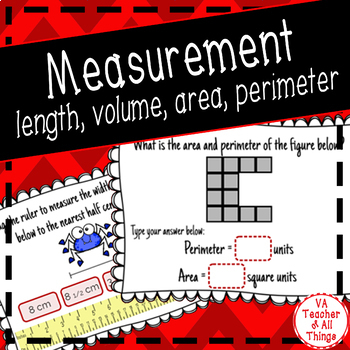 Review all things measurement with these 55 digital task cards! This deck reviews volume, length, area and perimeter of figures on a grid, and perimeter of polygons. These 55 digital task cards are interactive and self-checking. They align with Virginia SOL math standards 3.7 and 3.8. Interactive task cards ask students to select multiple correct answers, drag and drop items, type in answers, and click on correct choices. Great for TEI practice! To use Boom Cards, you must be connected to the Internet. Boom Cards play on modern browsers (Chrome, Safari, Firefox, and Edge). Apps are available for Android, iPads, iPhones, and Kindle Fires. For security and privacy, adults must have a Boom Learning account to use and assign Boom Cards. You will be able to assign the Boom Cards you are buying with "Fast Pins," (play provides instant feedback for self-grading Boom Cards). Fast Play is always a free way for students to engage with Boom Cards decks. For additional assignment options you'll need a premium account. If you are new to Boom Learning, you will be offered a free trial of their premium account. See the preview for a link to further information. If you choose not to stay on a premium account after your free trial, you will still be able to assign all your Boom Cards to as many students as you see fit using Fast Play pins (which give instant feedback for decks that are self-grading). Not sure if you'll like Boom Cards? Try free Boom Cards deck first.